I acknowledge that it’s been a while since the first post – I have just been through a rough episode of headaches when I tried to find a new pillow. The old one is wearing out from several years of compression. It was never going to be a long-term solution anyway. I had reversed an egg-foam contoured pillow as I found the foam on the underside to be softer and less dense. However that pillow manufacturer no longer makes that pillow as it prefers, naturally enough, to make a pillow from sturdier, longer-lasting foam. It’s difficult to explain to people selling bedding what I need in a pillow. No, not memory foam (which feels like it is moulding tightly around my head). No, some soft ones can compact into a hard brick under my head. Yes, it needs to be low as otherwise it can feel like my neck is being stretched higher than it wants to go. No, some low ones are still too high. And it all depends on the surface of the bed I’m lying on – if the bed is too soft that is enough to make some low pillows seem too high and my neck feels under pressure again. If it all sounds as if I’m being too fussy it only takes a short time lying on the wrong type of pillow before I wake up in trouble. Both my eyes become bloodshot and narrowed. I am going to need some serious medication to recover. It isn’t a normal case of needing to take a week or so to adjust to a new pillow. If it causes my head to feel rigidly compressed then I will never adjust to it. I don’t know whether it’s the nerves, the blood vessels, the muscles- something feels like it is being pressured – all I know is that I have got to get off that particular pillow. Needless to say I have a huge collection of pillows for visitors. Eventually I looked back at a pillow I had as a teenager which I had saved for just such an occasion. I googled the words on the label and eventually tracked down a manufacturer in the U.S. (I live in Australia) and arranged through Amazon to order that type. It arrived a few days ago and I am fine. When I awoke later during the night without head pain I felt a deep level of relief which has lasted for a number of days. This information may be totally useless to you as I realise that my head is extra-sensitive – I never lie on my left side even when I have a suitable pillow as it stirs up a headache on the left. And I never attempt lying down unless I have taken pain medication for the nervous system. Consequently I sleep on my back or on my right hand side and I don’t take naps or lie on a lounge during the day. 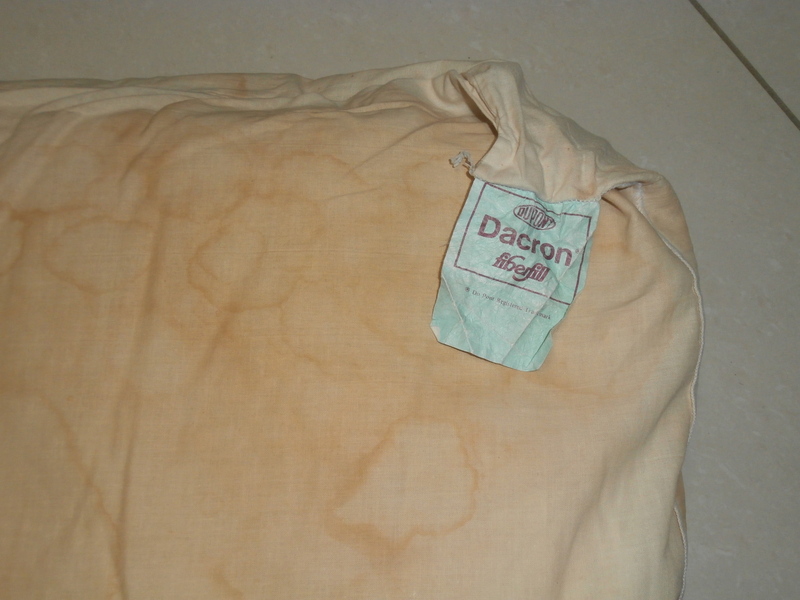 For the record the pillow is a Dupont Dacron II Polyester Hollofill. ** If you have found a pillow that works for you, stick with it. If you need a new pillow in the future and you were not satisfied with your old one then you might consider this pillow. I would only write this blog if I thought that some of my ways of alleviating pain were transferable to others who suffer with chronic pain. If the diagnosis ( I am referring to chronic myofascial pain with a component of nerve disturbance) is correct then there have to be common physiological changes that can be addressed in the similar ways. Hi, I’m Janet and this is my story of Chronic Pain. Chronic – Well 36 years should count as chronic in anybody’s books. Pain – Aching, burning, relentless, moderate then very strong, mysterious because often there seems to be no direct cause, occurring in just about every quadrant of my body though not all at once. It hurts that others don’t understand how difficult it is to live with pain. It hurts that doctors can’t take the pain away. And yet my life is so much more than pain. It is a life worth living and a story worth telling. An Endocrinologist had said that my muscle pain was a result of having Hashimoto’s disease – a term for an underactive thyroid. The first Rheumatologist I saw told me I had fibromyalgia and this was the diagnosis I lived with and which other doctors accepted for a number of years. A General Physician much more recently had said to forget about fibromyalgia – instead it’s a disease of the nervous system that is giving me neuropathic pain. My best understanding of this term is that the source of the problem is the nervous system but it shows up as pain in muscles and other soft tissue as well as in the nerves. And a Musculoskeletal Physician has said that I also have myofascial pain which has disturbed the nerves so that I experience local pain as well as referred pain. Obviously chronic pain is difficult to understand even for doctors. For the present I think chronic neuropathic, muscular and myofascial pain is a good description. Hi, whoever you are! I assume you are reading this because you also have a pain condition. I want to give you hope. I will share things that have actually reduced my pain or given me inner strength. And don’t forget my Disclaimer : You should seek medical advice from a health professional about your medical condition and treatment. Be aware that your type of pain may be different to mine. I have repeatedly tried and proven to myself the measures and products I will write about. But if you try something that I discuss in my blog, then you alone are responsible for making that choice or for purchasing that therapeutic aid.